Back to another monster from Mansions of Madness. 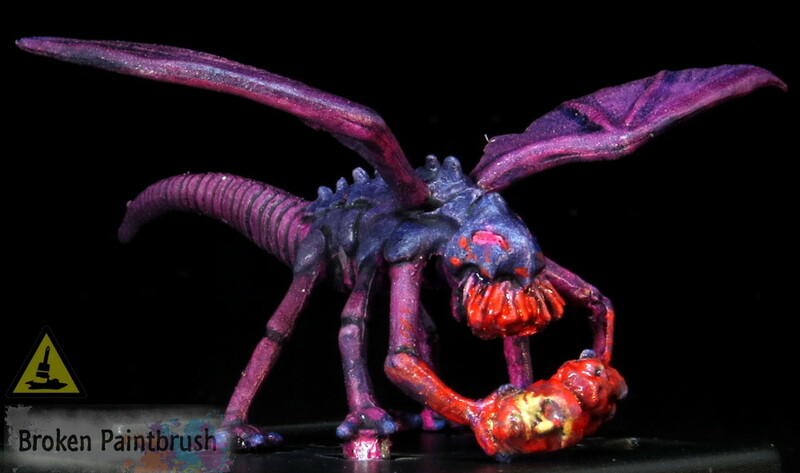 This week I have the Mi-Go models – odd looking fly/bat/mosquito creatures that like to eat brains. 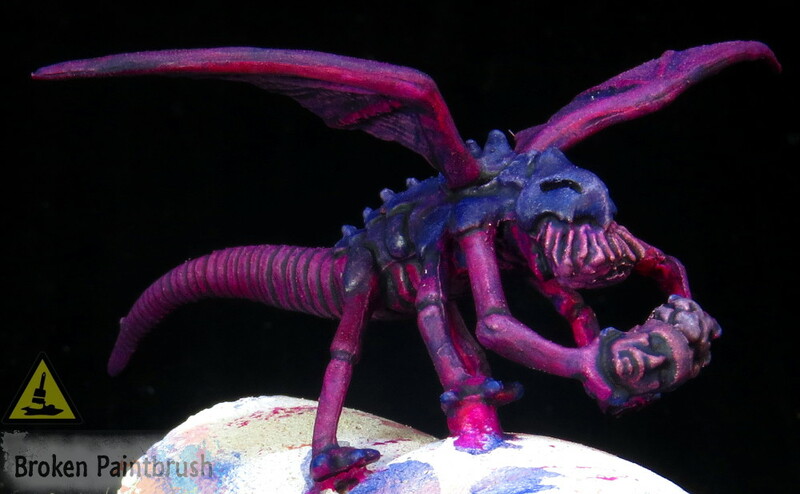 I went for an other-worldly look with pink and purple skin and blue carapace, and of course, blood. I used two main techniques on the Mi-Go: drybrush and wash. This allowed them to be done relatively quickly while still pulling out the details. After a white primer, I painted all the base colors to get a sense of where each would go. This has been particularly hard for the Mi-Go as they were going to be pinks and blues – which can get a bit garish if not balanced well. The first layer was doing the carapace. I chose to do dry brush from this model for two reasons: it would be quick, and it has lots of textures that work well with dry brushing. So grabbing my small dry brush, I applied a layer of Electric Blue over all the blue areas. 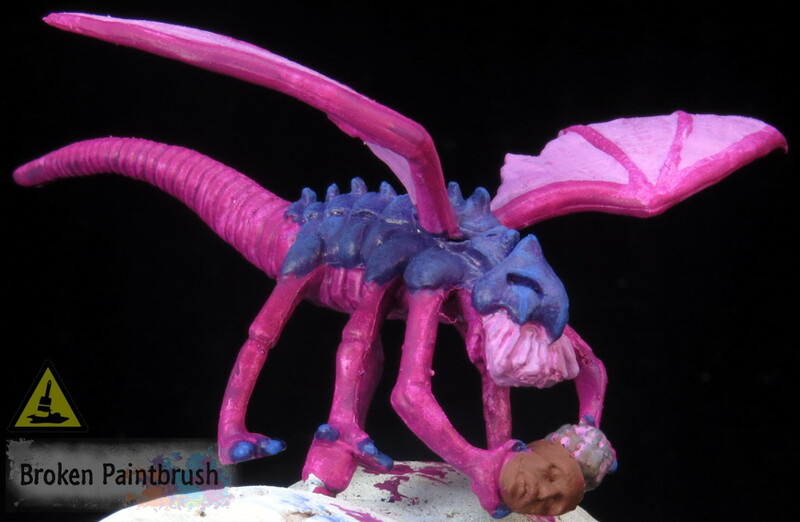 If I got it on the skin, I re-applied some Warlord Purple to clean it up. 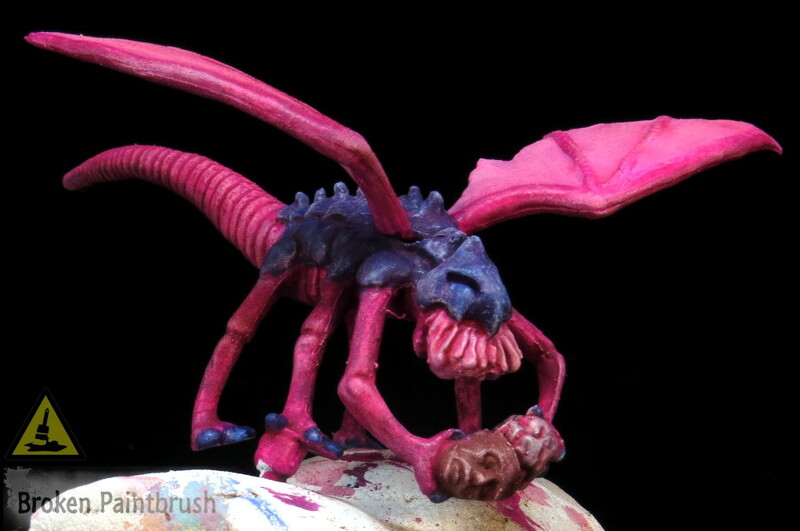 Now moving back to the skin, I dry brushed it with Squid Pink. 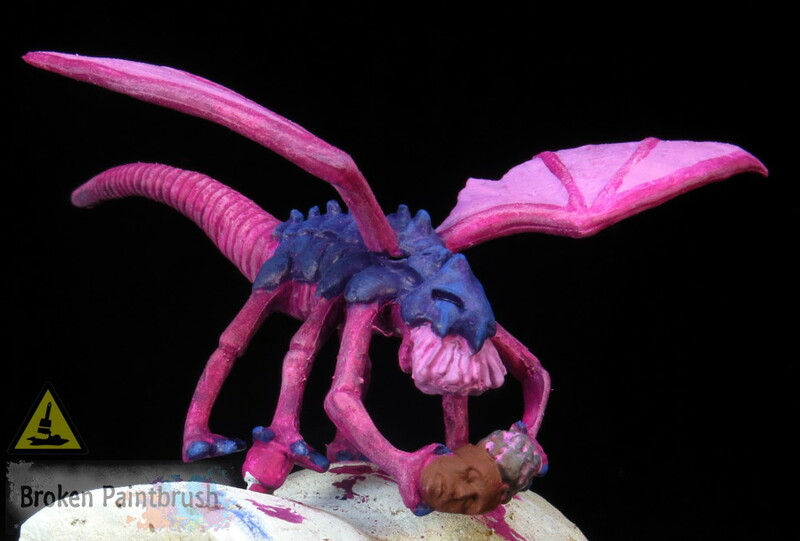 This was the base color of the fleshy wings which helps bring them together rather than looking disjointed. Here I had to start being careful with the dry brush so it wouldn’t get on the blue. But I wasn’t as concerned with keeping it smooth as the washes would fix many of the errors. Next was to bring all the highlights together by dry brushing the whole model with Pale Flesh. This seems a bit odd on the blue, but by sharing a highlight it makes the model look more natural (well as natural as an otherworldly being could be). The dry brush does start to look a bit dusty at this stage but will soon be rectified with the washes. Now for the fun parts: adding some washes. I love washes as it does two things: it adds shadows instantly and softens color transitions. This is extra helpful with dry brushing as all the later, dusty looking layers get softened a bit to look more like layers. I started with a straight red wash, in this case, Baal Red (yeah still using some GW colors :-). And then we get crazy. The pink was too much for me, more candy-like and not monster-like enough. 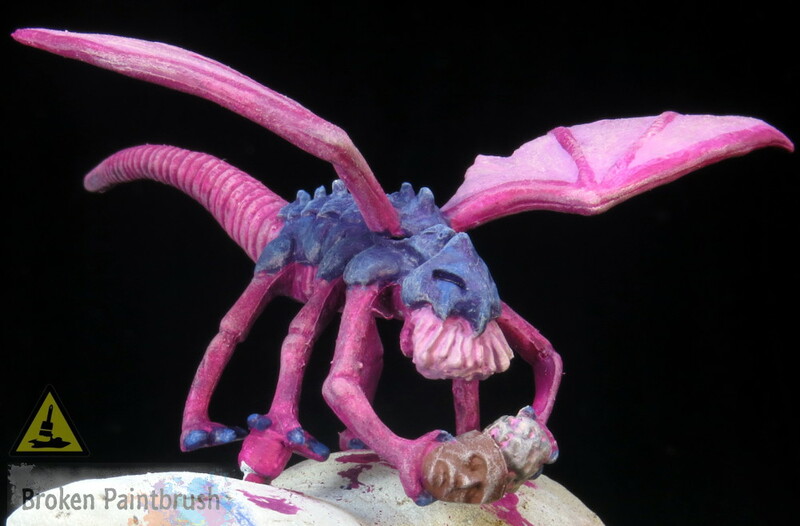 So I added a bit of Prussian Blue (very dark shade) to the Baal Red wash to create a dark purple. It ended up being more of a glaze, being a bit thicker than the wash which worked out well. 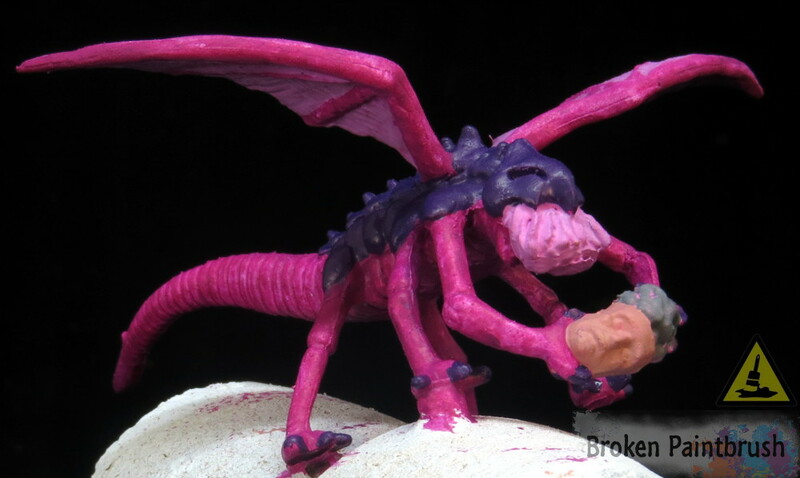 The pinks turned to more of a magenta-purple, and it added a nice cool shade to the veiny wings. And to give them even more monster scary powers (and highlight their snack), I added blood effects. This was the same formula for the Cultists and Maniacs. A base layer of dark red was splotch around with a brighter red layered inside. I focused the effects on the brain, claws, and mouth/tentacle things. It helps to bring the focus back to the head since most of the model is now purple/blue. I know some of you are getting tired of the Mansions of Madness models, but fear not! I am nearing the end of the set and getting ready to build some more 40k models. Or, more likely, I will be mixing it up more. Previous PostHi. I’m Thor. Let’s Chat About Blogging!